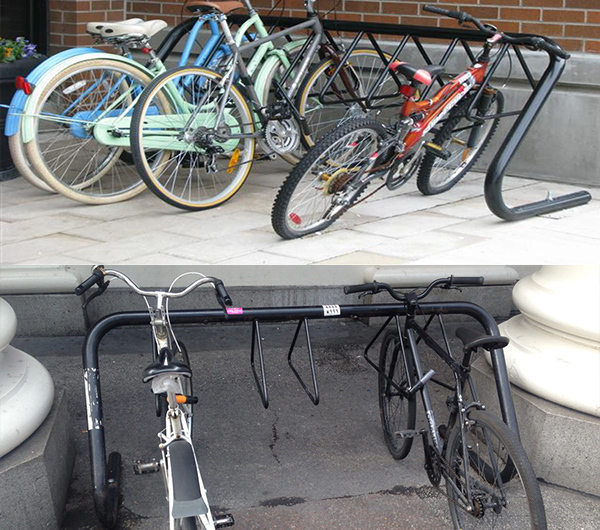 Do you know the difference between good bike parking and bad bike parking? Chances are you don't, that's why you're here. Don't worry we're here to help you understand what makes a good bike parking rack and what makes a not-so-good bike rack. 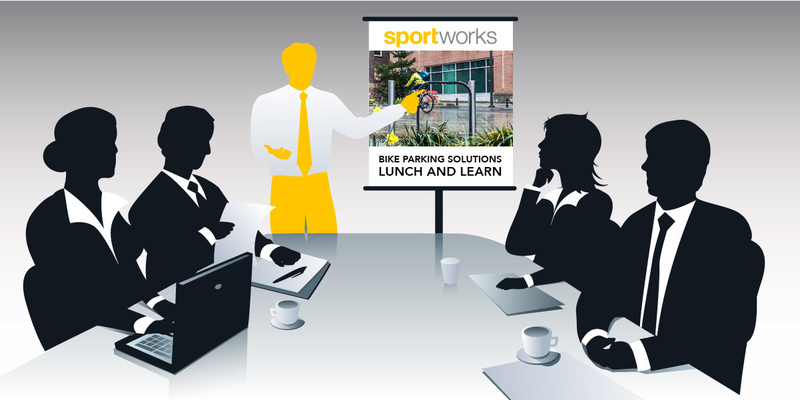 At Sportworks, we pride ourselves on creating the best bike parking in the world. 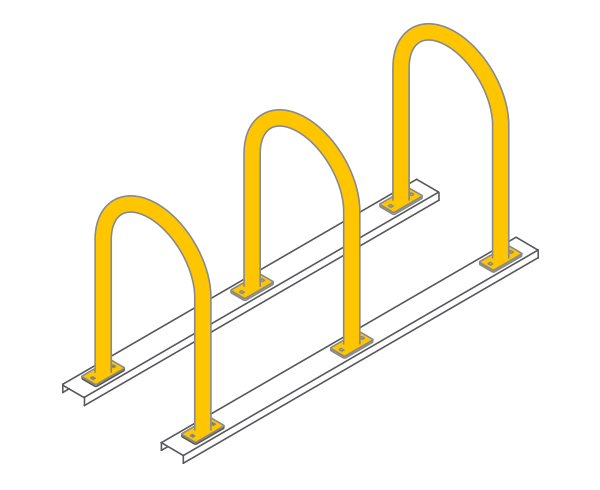 HOW DO YOU IDENTIFY A QUALITY BIKE RACK? 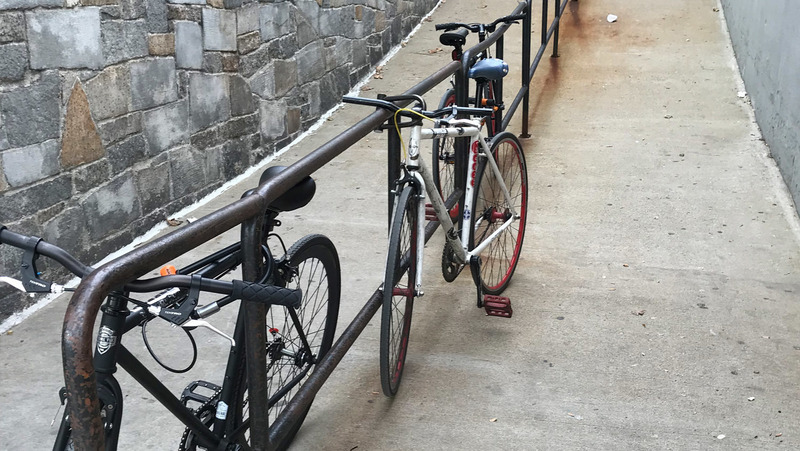 The Association of Pedestrian and Bicycle Professionals (or APBP) states that an acceptable bike rack will provide two points of contact with the frame and allow a U-lock to capture one wheel and the frame. 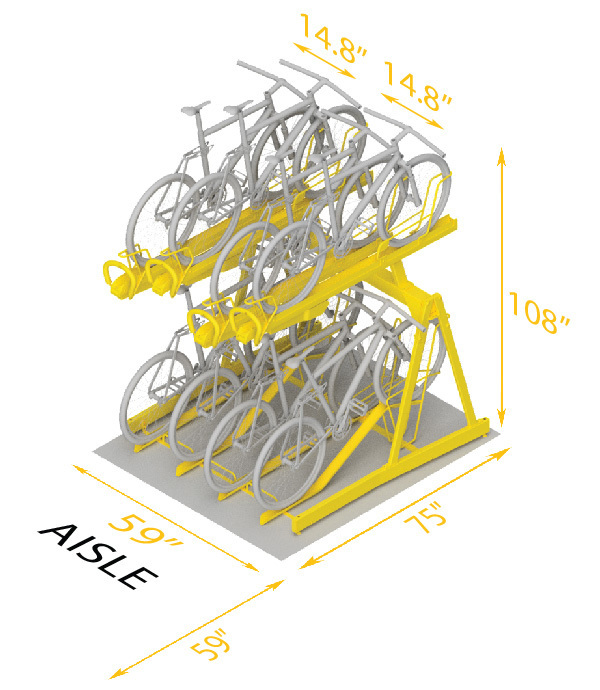 In addition, racks should accommodate all common bike styles, and first time users should recognize the rack as bike parking and be able to use it as intended without instruction. Choose a rack that will support the frame in two places at a minimum. This helps to ensure orderly parking. 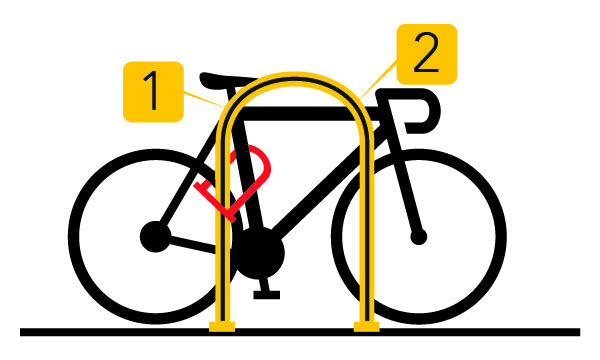 Coat hanger racks and similar style racks with small gauge metal are easy for thieves to cut through leaving less bike parking, and more headaches. Not bikes. 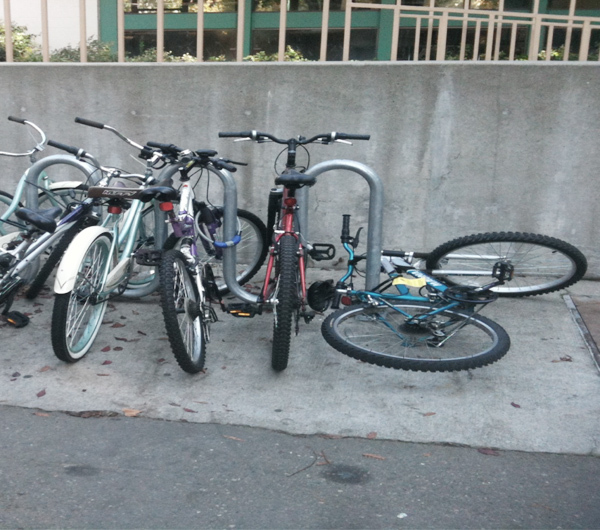 Wave racks are one of the worst racks to proliferate the bike parking landscape. These racks cause confusion to novice cyclists and often leave bikes in a messy state. Cyclists are never happy when they come back to a sight like this. Save the waves for the beach. The first step to installing a proper bike parking solution is to identify and evaluate your location. Be sure to observe where and how cyclists are currently parking their bikes. If bike parking does not exist yet, people will take it upon themselves to create their own bike parking, whether it’s a tree, a light post, or anything else compatible with their lock. Installing bike parking eliminates the need for cyclists to creatively meet their bike parking needs. If a cyclist cannot easily identify where to park their bike, they may not even use your bike parking area. They’ll instead create their own solution, based on whatever is available that seems to be secure. 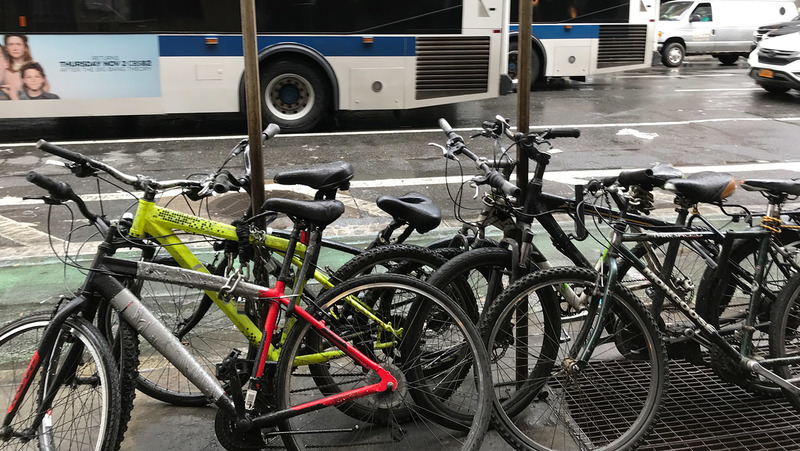 Make it a top priority to place bicycle racks in high visibility areas, especially near the entrances they serve, or other areas that have high pedestrian traffic which will deter bicycle theft. Adding bicycle parking specific signage can help direct users where to park and/or how to park, and may attract more people to arrive by bike. 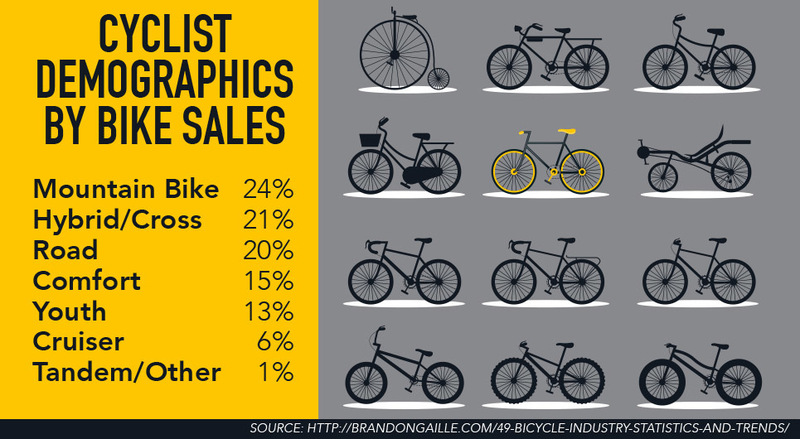 Ask yourself, how many bikes do you need to accommodate for your business, office, campus, or residential building. For preliminary determination, it is advised that you check with your city or local government to confirm minimum ordinances or mandates applicable. 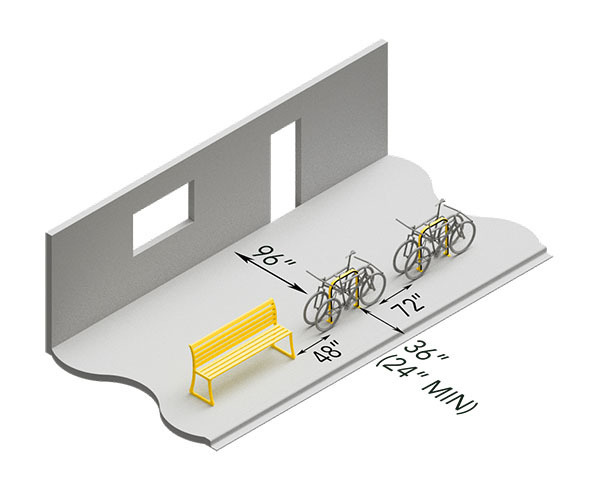 As soon as you've decided on the quantity of bike parking spots needed you will then have to ensure that there is ample space available to fit the bike parking racks needed to accommodate your needs. 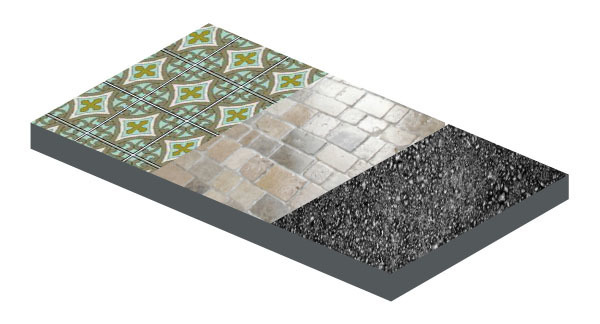 The recommended and minimum amount of space required for various layouts is shown in the following diagrams. Better density, with the tradeoff being ease of loading and unloading. Expect some handlebar and pedal interference with adjacent bikes, in some cases. Much greater ease of use for end users. No pedal interference, and handlebar interference would be rare. When configuring your bike parking installation, be sure to allow proper setbacks from buildings, pedestrian routes, and street furniture. This allows racks to work as designed and maximizes ease of use. We've shown generally accepted setbacks here, but be sure to check with your local government for the requirements in your area. Concrete is the ideal surface for mounting racks securely and safely; plus, it’s cost effective. 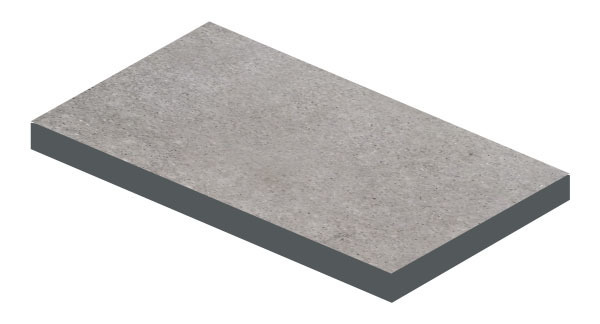 Surface and in-ground mounts both work well and are easy to install in concrete. Freestanding rail mounted racks are recommended for these surface types. 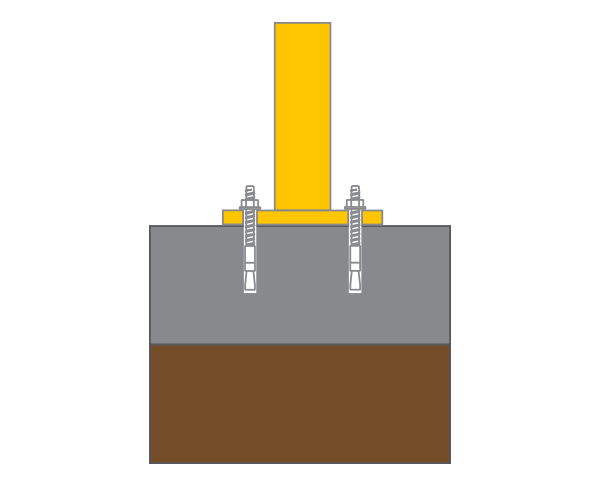 However, asphalt specific anchors are an option. Note that masonry bits can fracture tile. 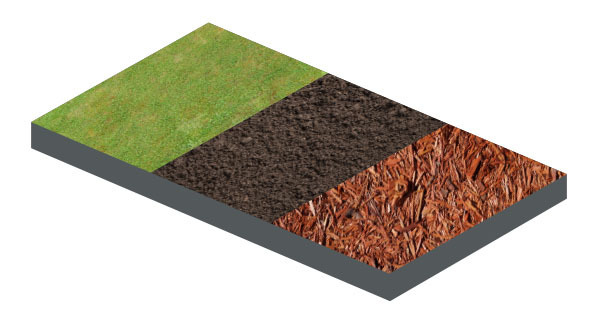 With materials such as turf, dirt, or mulch you have two options: utilize rail mounting to create freestanding racks, or use concrete footings to embed or surface mount the rack. This mount type uses mounting feet and appropriate hardware to anchor the rack to the ground. Sportworks recommends using tamper-proof hardware for greater security. 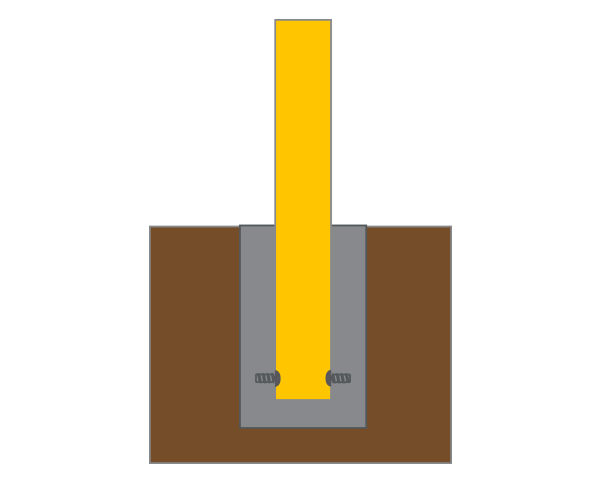 The embedded or in-ground mount type requires the rack to be installed prior to pouring the concrete. Mounting rails allow racks to be grouped together and may be left freestanding or anchored to the surface to ensure they stay in place. According to the National Bike Registry, it is estimated that over 1.5 million bicycles are stolen each year. With so many bikes being snatched up, it's important that you register your bicycle, if you haven't already done so. 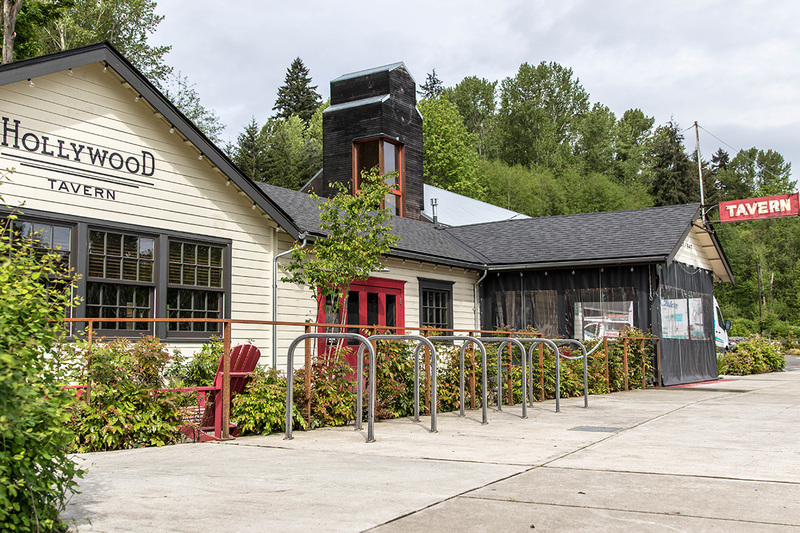 We recommend registering at both the Bike Index and Project 529. 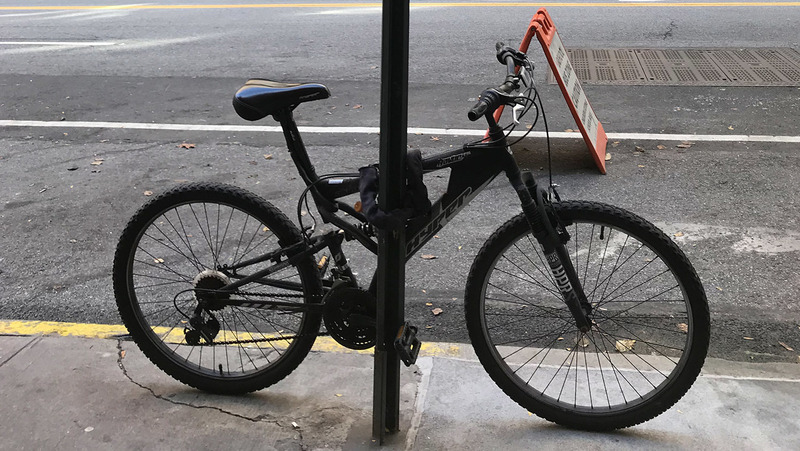 With bikes costing upwards of several thousand dollars, cyclists want to feel secure with the type of bike racks they are locking their wheels to. We always recommend cyclists use a high security u-style lock and to secure the wheel and the frame, ideally both wheels (especially if the bike has quick-releases) and the frame. Avoid using cable locks, they are typically made of materials that are easy for any thief to cut. 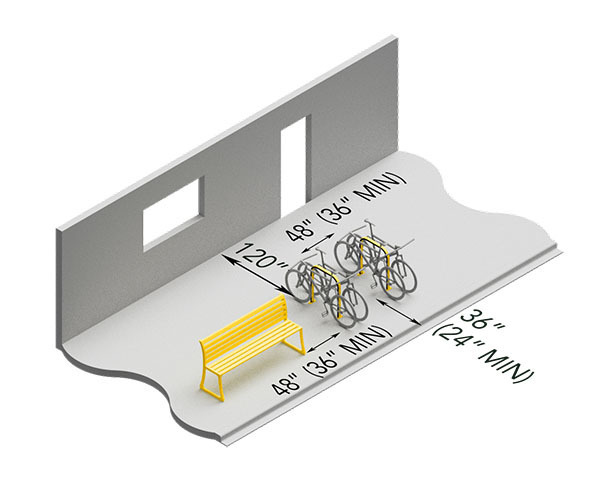 There are various ways to ensure you provide the safest bike parking to the cyclists your project will serve, consider the following measures you can take to provide secure bike parking to your end users. With enough time and power tools, a thief will eventually cut through anything., but to maximize security and deter thievery, choose heavy-duty square or rectangular tubing which is resistant to traditional pipe cutters. 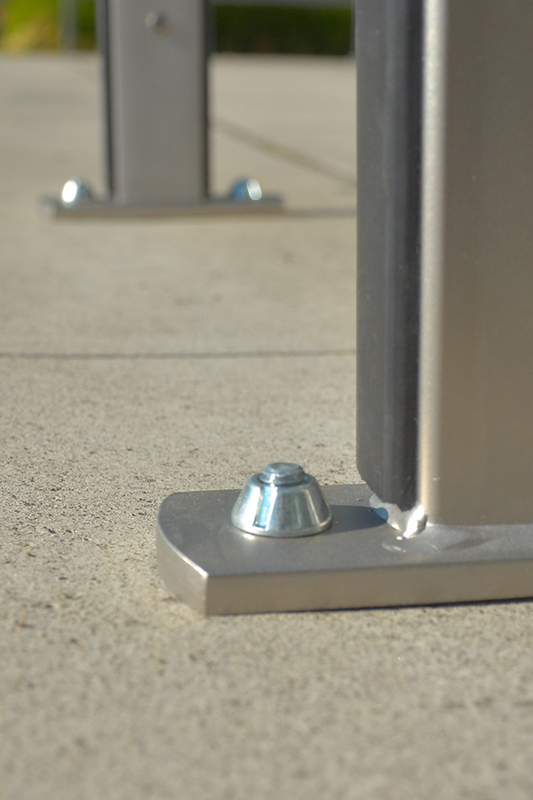 If the bike racks will be bolted to the surface, we recommend the use of breakaway nuts or other security hardware. For vertical racks, the addition of integrated cables provides the end user with an extra layer of security and comfort by adding the ability to lock both wheels and the frame to the rack. 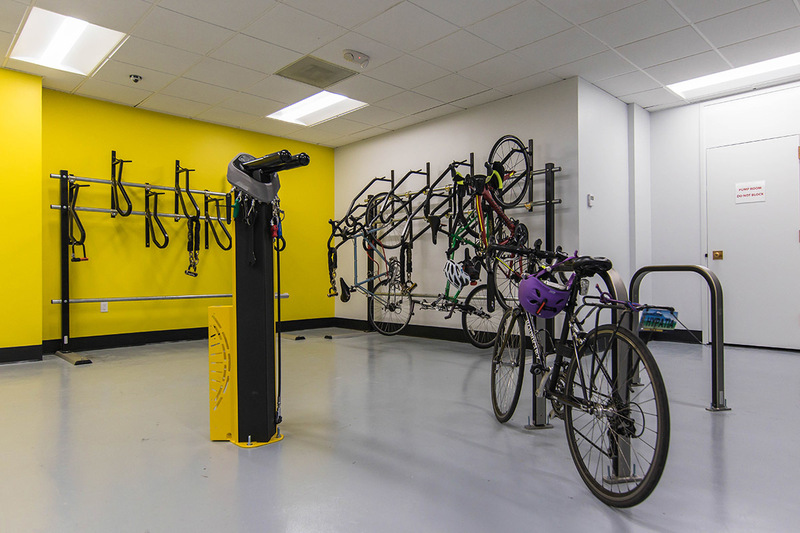 Bike rooms provide a great opportunity for high security, long-term bike parking due to their access control, convenience, and year-round accessibility. 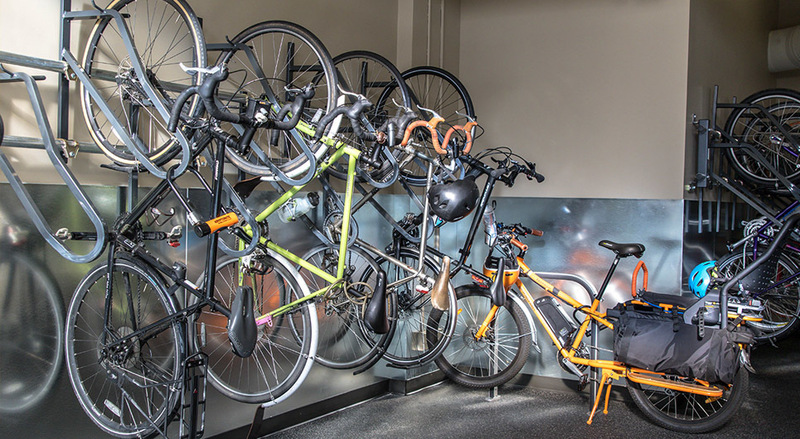 Dedicated indoor storage rooms are praised by bicyclists for residential and commercial use. In-street bike corrals work well in dense areas with limited sidewalk space and lots of pedestrian traffic. 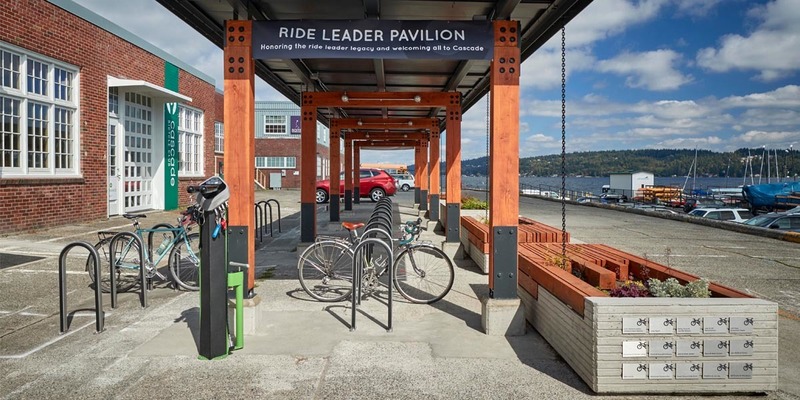 In cities such as Portland and Seattle, some businesses are now requesting bike corrals in place of car parking as they attract and accommodate more customers. 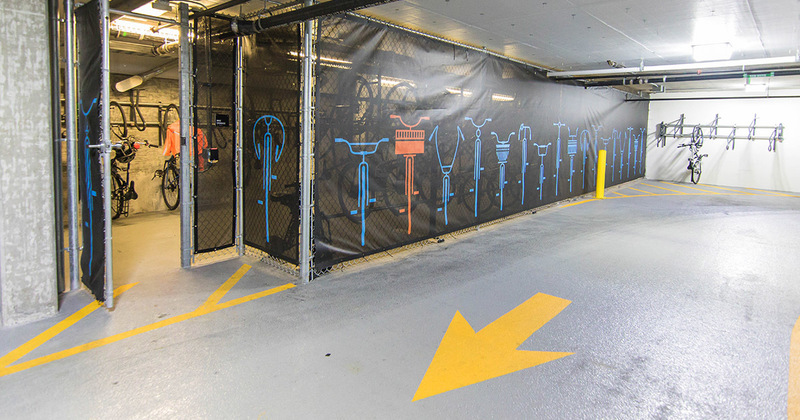 Bike cages are a great way to create secure bike parking spaces by utilizing areas of parking garages that may otherwise go unused. Screens and key card access are two ways to increase security of the bike cage. It is recommended to include visitor accessible bike parking when creating this type of secure bike parking area, as seen here. 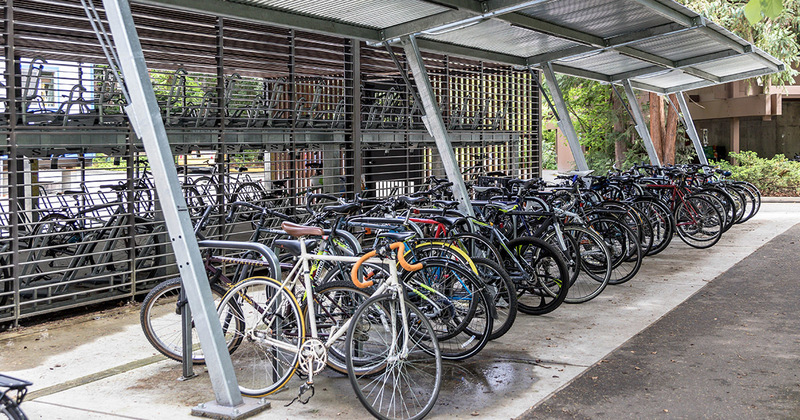 A great way to provide longer term bike parking is to provide a shelter that covers the bike parking racks. Providing enclosed shelters obviously offers the safest long term solution, but overhead shelter is a great option as well for protecting end users bicycles from the elements. Both are pictured. 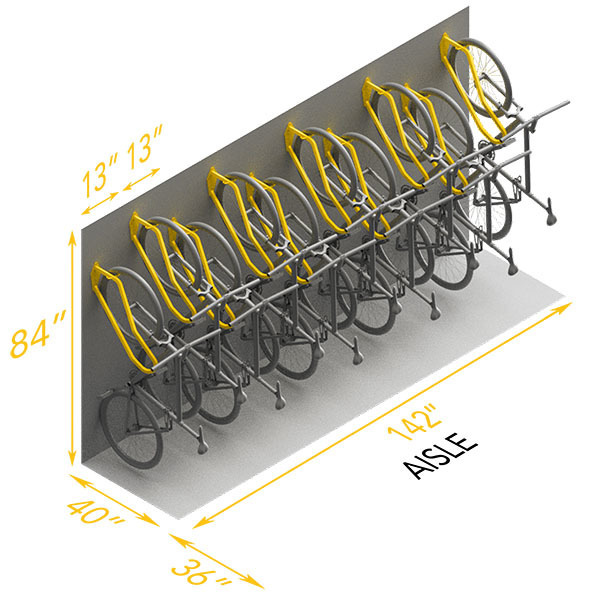 The go-to way to provide the most secure form of long-term bike parking allowing users to store their bicycles for days, weeks, or even months at a time. 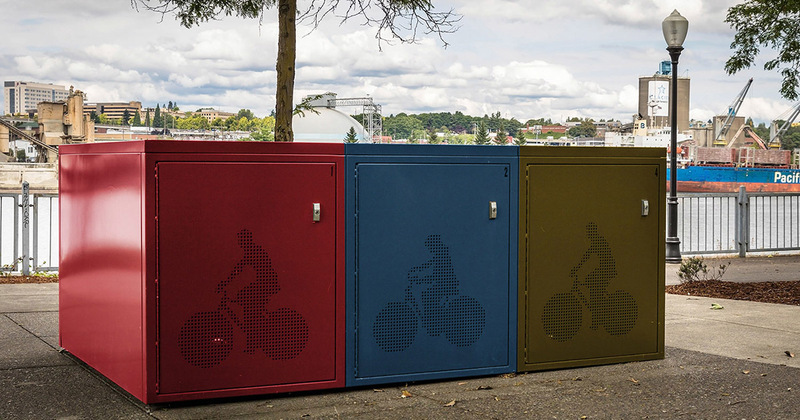 Bike Lockers can be utilized indoors or outdoors, as a part of a bike room or independently. With all kinds of riders, naturally comes all the types of bikes they love to ride. When planning a bike parking room or space, make sure you consider the types of bikes that might be ridden by your user. 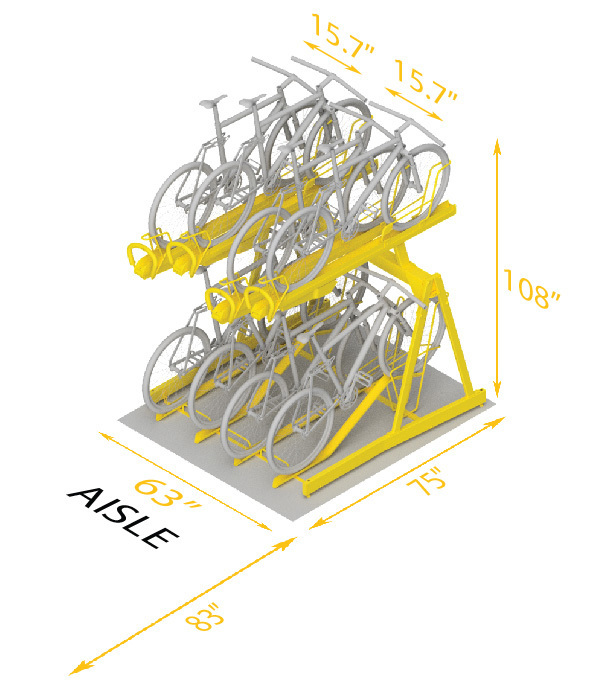 Consider the benefits of installing both VERTICAL and HORIZONTAL bike parking. 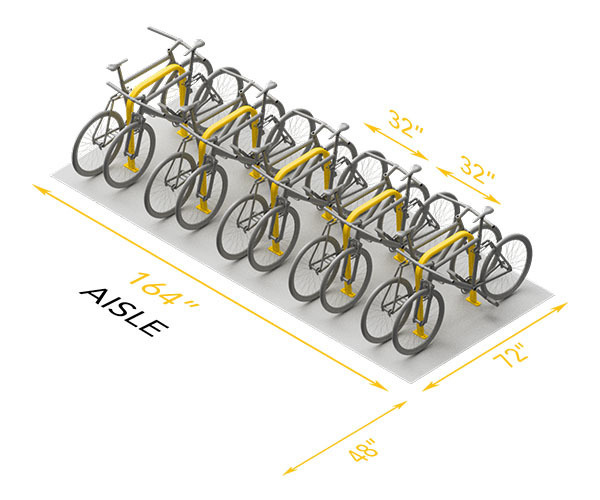 We highly recommend evaluating the types of bikes that your users ride to help determine appropriate rack types and spacing. For example, mountain bikes and cruisers have wide handlebars, while recumbents and tandems have longer lengths. It's important to consider that cargo bikes, electric bikes, and tandems might be too heavy or long for vertical racks. This is where a combination of VERTICAL and HORIZONTAL parking comes into play. 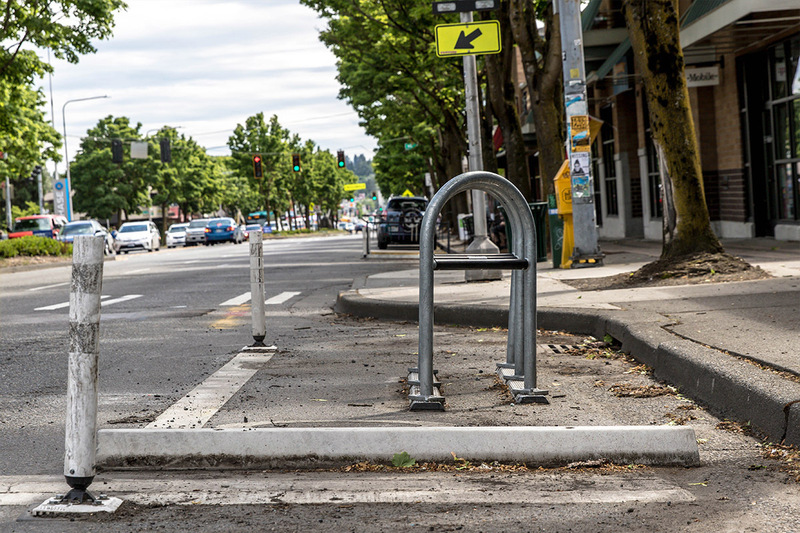 For first-hand recommendations of bike parking opportunities and best practices in your community, consider contacting your local bicycle advocacy organization. Here are a handful of the groups located throughout the United States. There is a lot involved in creating useful, secure bike parking. We're here to help you. If you have any questions, please reach out and we'll guide you along the way. Feel free to download our bike parking guidebook. 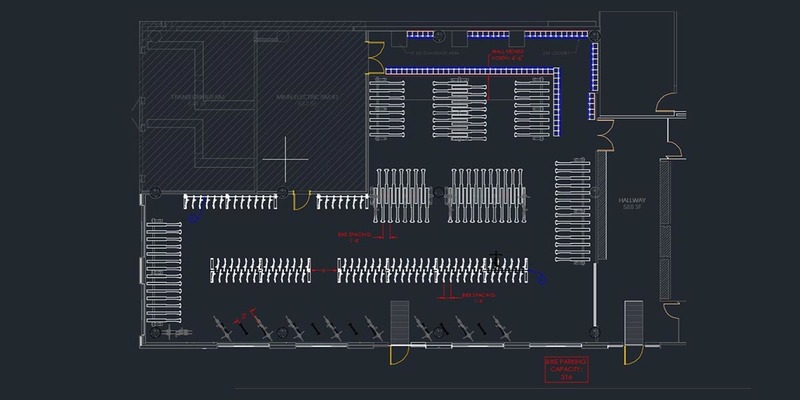 Have one of our engineers put together the perfect layout just for you. 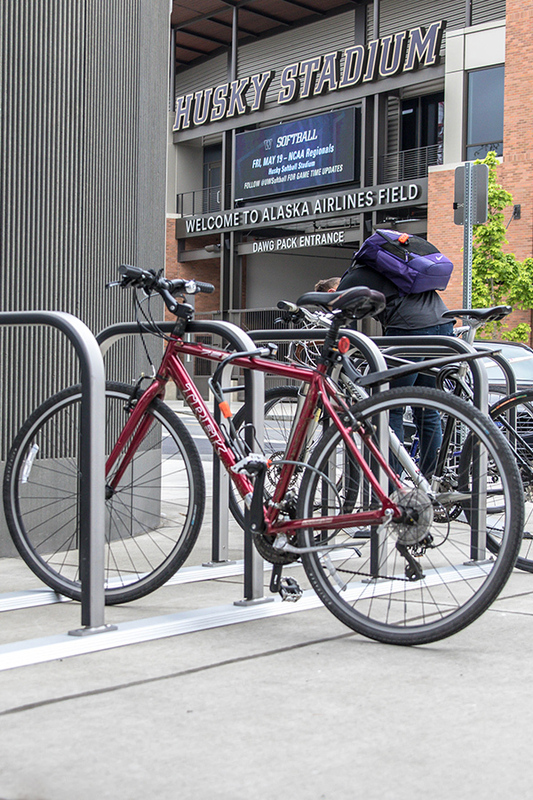 Learn more about bike parking and get AIA and ASLA credit by booking a Lunch and Learn course, available now as a webinar.